Yes, they would appear to crawl onto land. Considering how some sightings have been placed within isolated bog pools and remote mountain lakes, amphibious capability would have been something of a prerequisite. While the trait may initially appear unlikely for a predominately aquatic animal, it wouldn't necessarily be unusual. Seals have been known to flop themselves for a considerable distance over land and even lowly eels are able to slither out of water for a mile or so. Hence it shouldn't come as much of a surprise that peistes have been known to embark on terrestrial excursions themselves. Though few, these sightings are unique from water-based reports in that they offer a greater window into the animals' morphology. While land sightings are very valuable for the information they provide, they tend to be very limiting just the same. Outside of their natural element, these animals would seem to be rather timid. Most often land reports are brief, usually ending in a strange shape taking immediate flight back towards the water's edge. Their heightened level of alertness during terrestrial excursions has probably created more instances where a would-be witness only caught sight of a sudden splash thrown up near the shore by an unseen source. Nevertheless from those special instances when a ground-bound beast has been spied upon we're provided greater incites into not only morphology but aspects of behavior as well. The Water-Horse: More than a Myth? Celtic mythology and subsequent folklore described Each-Usiage (water-horse), also known as the Kelpie, as a sinister entity who lured prey by posing as a grazing horse near the shoreline of a lake or river. According to tradition, some unsuspecting traveler would come along and foolishly mount the inviting animal whereby the fiend would take to the water with its soon-to-be-consumed rider. Initially these types of stories seem in league with that of water-nymphs; fairy tales designed to teach that evil can take on innocent and seductive forms. At the same time though, not all stories of the water-horse necessarily involve a fatal ending. Some tales tell of them coming ashore during the night to graze upon crops. More commonly recited are stories of farmers approaching a what they assume to be a stray horse until it suddenly takes to the water and dives away. Sometimes a water-horse could be seen swimming or amphibious tracks could be found in the morning testifying to nocturnal excursions. Whereas the Banshee and the Leprechaun may have eventually disintegrated into mythology, there yet remain places where the water-horse is revered as something very real. Before their possible existence is dismissed on account of the colorful presence in folklore and fairy tales surrounding Each Usiage, one also needs to recall that "normal" animals such as otters, crows, badgers as well as dogs and cats were also given fanciful characteristics in fireside stories yet they still exist. While researching horse-eel reports in Connemara, F.W. Holiday was directed to Patrick Canning who decades prior had a bizarre experience along Lough Shanakeever. This account was originally recorded by FW Holiday and first published in The Dragon and the Disc. During a visit to Shanakeever back in 2001, Tom Joyce was able to provide me with further details not mentioned in Holiday's book. The event transpired on a rainy morning in 1944. Mr. Canning was in the process of walking down towards the lake to fetch his pregnant mare out of the elements. When the donkey spotted Patrick it stood up and in doing so gave view to a black animal circling her from behind. Canning immediately assumed this unexpected figure to be the long-awaited foal, circling its mother as if intending to nurse. Because its proximity to the stream flowing out of the lake, Canning hastened his steps lest the newborn wander too close to the water's edge. But as he was approaching, the animal seemed to have detected him and promptly disappeared into the water. The mare would bear her real foal a few days later. After grasping what had just occurred, Patrick recalled that there had been a few odd features about the "foal". In his interview with Holiday he provided a brief description of the animal seen from an estimated distance of 300 yards: "It was long. And it was rather a bit high, you know. It was black. My sight was not...because there was mist and rain and everything. The neck seemed to be...I'd say it was a bit long...." He would go onto to claim the animal had legs and ears upon its head. It circled the donkey "gently". He was certain it was not an otter. In spite of his initial misidentification, Canning understood what he'd seen was what was referred to locally as a horse-eel. Holiday brought up that horse-eels are said to have an eel-like tail but Canning replied that he hadn't noticed one. It's important to point out that Patrick Canning's sighting was biased, not because he had heard of horse-eels before but because he initially assumed the animal was a foal. Therefore he initially would have expected the usual features already found on a foal, even if they were absent. There is a remote possibility Canning could have seen a seal. However, it would have been a first for Shanakeever and it still wouldn't adequately suffice for the various other reports coming from the lake. Further more, the jerking propulsion of a seal on land could hardy be considered as "gentle". Aside from the puzzling description, this sighting offers an indication of an inquisitive behavior which shall be seen again in sightings to come. Tom Joyce kindly took the time to point out the exact spot where the mare had been during the encounter. 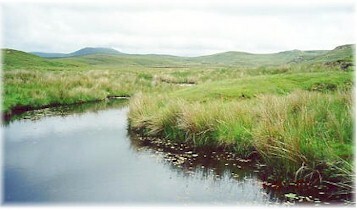 Further up the stream lies Lough Shanakeever. It's easy to see how an animal entering or exiting the lake would have noticed the mare during its passage. The proximity between the two animals was near enough that Canning assumed the 'foal' was about to nurse. Some Celtic legends tell of livestock-eating water monsters but in this case the behavior would almost seem to indicate a form of curiosity. Perhaps such tales were spawned out of similar occurrences where farmers were alarmed to find strange creatures sulking towards their animals. During his interview, Canning went on to tell Holiday of a similar incident passed orally through his father. According to the story, many years earlier some children had gone down to the shore of Lough Ballynahinch where they saw a "grand little foal". They ran back to the house to fetch their parents but upon returning the animal promptly took to water. After telling the story Canning stressed quite clearly to Holiday that as far as appearance the horse-eels "...are very like a horse!" As stated before, these very animals reported throughout Ireland are also reported in certain areas of Scotland and even Iceland. The following is taken from Peter Costello's In Search of Lake Monsters citing a water-horse sighting on the Scottish island of South Uist. Ewen MacMillen, Bunavullin, Eriskay, of Sky descent, aged about fifty, tells me that four years ago at the end of May or beginning of June he had gone to look after a mare and foalthat he had at about nine or ten o'clock p.m. He went up to Loch Duvat (Eriskay) to see them. There was a foggy haze. He passed at the west end a horse belonging to John Campbell, Bunavullin, and a horse belonging to Duncan Beag MacInnes, ditto. He saw an animal in front of him on the north side of the lake which he took to be his own mare and was making up to it. He got to within 20 yards of it but he could not distinguish the colour on account of the haze, but in size it appeared larger than a common Eriskay pony. When he came to within 20 yards of it the creature gave a hideous or unearthly scream (sgiamh granda) that terrified not only MacMillan but the horses that were grazing at the West end of the lake, which immediately took flight. MacMillan ran the whole way home and the horses did not stop till they reached home. These horses were not in the habit of coming home although they might come home on their own occasionally. Costello wrote that Father McDonald identified the entity as a water-horse but placed them in the same grouping as ghosts and other supernatural entities. The circumstance of MacMillan's sighting echo Canning's quite well. In both cases the weather was at least damp. Both mistook the animal for their own and both the creatures were in the company of other animals: Canning's mare and in this case a group of horses. And of course, neither beasties were keen to the presence of humans. The scream in this latter example is especially noteworthy since there's been very little indication elsewhere that these animals made any sort of sound. As unlikely as it would seem, there may be a kernel of truth to the kelpie-drowning stories. In a chapter designated to the Highland Water Horses Peter Costello writes of story gathered by Dr. Oudemans, a devote advocate for the sea serpent and one of the first scientists to examine reports of the Loch Ness monster. Dr. Oudemans obtained a strange little tale about a deep pool in the Garry River called "Children's Pool," which flows into Loch Oich. Tradition has it that many years ago some children residing at Inchlaggan were playing on the loops of the Garry at this spot when a huge "beiste" in the shape of a deformed pony appeared on the bank of the river. Curious to learn whether the creature was not a real pony on which they could enjoy a ride, the children went up to it, and, the story has it, that they found the "Beiste" so docile that one of them ventured on its back. No sooner had the child done so than the "beiste" plunged into the pool with the rider at the same time carrying with it a child clung to its mane. No trace was ever found of the bodies thus mysteriously drowned. Costello points out that "on consideration given that these animals are in fact some kind of large mammal...there is nothing inherently impossible about the story." Considering the size of these creatures and their evident sense of curiosity as noted in the Patrick Canning sighting, its unlikely such a beast would feel any threat by small children and may even perceive them with interest if nothing else. Perhaps it was a similar attraction that summoned the 'grand little foal' towards the children in the Ballynahinch story. And what's to say that in this case children in the course of exploring such a strange attraction might have gotten a little too close and a little too confident. The disarming likeness to a pony was exploited by one youth who playfully mounted the animal. It's at this point that the beast expressed its extreme displeasure by retreating back its watery domain with the child instinctively holding on for balance. Upon entering the water the young rider panics and drowns. A stretch perhaps but like Costello rightly points out, not inherently impossible. While trying to locate a culvert where a horse-eel supposedly decomposed within, Clifden librarian Paul Keogh and I came upon a story featuring a terrestrial horse-eel. Peter McDonagh is farmer living on Derrylea Lough right outside of Clifden. We'd stopped to ask Peter if he knew of the culvert in question or of any sightings of horse-eels in the surrounding lakes. At first he was confused as to what we meant by 'horse-eel' but when replaced with the more universal term 'water-horse', he then recited an experience had by his father. As the story goes, on a summer morning sometime during the early 1900s, Peter's father Matty McDonagh was delivering a load of coal to Clifden. As he was driving his horse-drawn wagon along a three foot tall stone wall separating Lough Derrylea from the road, a water-horse suddenly leapt up onto the wall. Frightened, Matty immediately sped away but when he looked back the water-horse had gone back into the lake. Since the culvert's horse-eel was likened to a "giant eel" it poses a mental challenge in trying to imagine how a large eel could possibly "jump" up onto a wall. When asked what a water-horse looked like, the response was simple and all too predictable: like a horse. In the same tiny lake the Coyne family had their famous sighting, a neighboring farmer by the name of Thomas Connelly reportedly saw another, if not the same, creature on shore. F. W. Holiday provided an interview with Connelly in The Dragon and the Disc where he revealed the details of his sightings. The event took place in early September of 1969 at about five o'clock in the evening as Thomas Connelly was after sheep in the mountains near Lough Nahooin. Upon nearing the lake he spotted an object on the shore about fourteen feet from the water. It was "very long," with a width of 2-2 1/2 feet, in general bigger than a mare's foal, very black and had four "stumpy" legs. Connelly caught sight of the animal as it was moving down towards the water in a sliding motion, "like you slide a log" before entering with a splash on both sides and submerging after a few seconds. Connelly commented that he was often around the area but had never seen such a thing before. H: What was the back like? Was it in humps or flat or...? What did it look like? Like an eel? Long like an eel? TC: Yes, it was. It was. The most that can be salvaged from such a sparse description is the note worthy presence of four "stumpy" legs, that it was about the size of a foal and was black. Again, missing is any estimation of animal's length. There is a brief clue to the beast's terrestrial propulsion: the "sliding" seems to suggest it probably crawled on its stomach with push from the short legs. This last one from Connemara isn't much of a land sighting but worthy of mention. Tom Joyce told me of an incident involving to a former neighbor (now deceased). The man was losing sheep to a nocturnal predator and suspected a fox or feral dog was responsible. To capture the culprit in the act he staged a dead sheep down by the shore of Lough Shanakeever. That night he waited all bundled up in a blanket as he overlooked the moonlit spot with his shotgun. At some point in the night his patience was awarded with the sound of something moving towards the bait. Unable to contain his excitement any longer he let off a blast from the shotgun hoping to scare the scavenger into view. But instead of a terrified dog or fox racing up the slope, there was a "huge splash" as something large plunged into the lake. The spray was too great to be produced by an otter. Ok, not really a 'land sighting' (especially since he didn't "see" the creature) but the animal was up on the shore. And no, there was no implication that the "thing" had actually been the true varmint. It's only crime was inspecting the deceased sheep sprawled upon the shore. Pity though that nothing is mentioned about tracks left near the carcass. Nick Sucik, 1998 interview with Tom Joyce. Whereas in Connemara the term "horse-eel" is heard, in parts of Kerry creatures of like description are dubbed "wurrums".. A land sighting was reported along Lough Brin that sounds much like the creature reported by Thomas Connelly. Peter Costello's In Search Of Lake Monsters tells of a twelve year old boy who was surprised to find a strange animal "basking" on the shore of Lough Brin. The animal was black (like TC's) and had four short legs (like TC's). And just like Thomas Connelly's sighting we're again left clueless as to the beast's general shape and whether or not it had a tail. Even though there's no further detail regarding it, the basking aspect is certainly interesting and somewhat unexpected. If it were truly basking, that would put distances against these creatures being a type of eel and lean more towards seals. (That is, until you consider that Lough Brin is 30 miles from the ocean and quite a distance up a mountain.) However if they do bask you'd think they'd be reported more often especially since basking would be done on daylight hours in favorable, sunny weather. According to Costello, W. R. Le Fanu wrote in his Seventy Years of Irish Life (1893) that in a lake between Lough Brian (commonly known today as Lough Brin) and Glencar a boy was bitten on the back by a "dreadful wurrum" while he bathed. The terrified child arrived home naked and bleeding claiming the beast had hunted him all the way home. The beast was "something like the form of a donkey". As pointed out before, the term horse-eel has been used to described quadruped equine-like animals as well as enormous eel-like creatures. Whether these are somehow the same species or two separate animals is a question that will probably linger up in the air for a while. Either way, this final example would appear more inclined to suite the latter variety. Near Lough Abisdealy (which supposedly translates into "lake of the monster") a man was driving his horse-drawn cart home very late one moonlit night when he spotted what looked like a huge eel crawling out of the water. The lake had been reputed for being the home of a enormous eel. There's nothing unusual about eels crawling out of the water but the reported sizes and more importantly its swimming formations have made the Lough Abisdealy monster unlike any known eel. What can one hope to gain by these vague reports? Six out of the seven appear to be addressing "horse-like" creatures and by comparing accounts side by side certain concurring traits emerge. Limbs: One benefit that land sightings provide are rare glimpses of the creatures' limbs. You'll note that only when the animals are not immediately likened to a foal or horse is anything said about the legs. Regardless of their incredible likeness to equines, it's highly doubtful that an aquatic animal would likewise bear long thin legs. Yet, you'd think that if they had stumpy feet in all cases and therefore were closer to the ground, that height, or rather lack thereof, would be the first give away against such misidentification. There are some water sightings that describe paddles or fins but these appear attributed to the more eel-like beasties. Terrestrial Activity: Why might they come ashore in the first place? Transit- The first and most obvious reasoning would be to reach other bodies of water when streams or rivers are unavailable or obstructed. Eels already do as such. However for the most part these sightings don't describe the beasts lumbering far from water, rather they tend to be close to shore. Most likely lengthy journeys are done nocturnally as the Lough Abisdealy report would appear to imply. Curiosity- Curiosity would appear to summon the animals ashore in some instances. We've seen examples of the creatures being seen ashore as they spy on children and farm animals but not included are instances where the creatures were in the water and approached or stalked someone along the shore. Tom Joyce explained that while he was growing up he'd hear several cases where farmers cutting peat near the shore were startled to find a horse-eel creeping up on them from the lake. Basking- Currently there's only one report where the beast was cited as "basking". I'm a little skeptical on this aspect. An important detail that's lacking in many of these reports is the weather conditions at the time of the observations. Initially there would appear to be a preference for damp weather. The skin is usually described as being eel-like*, having no hair but being smooth/slimy even "sparkly" in the sunlight. Perhaps just the same they are vulnerable to dehydration in prolonged exposed to the sun. Hence the indications suggesting most movement transpires during the night. Scavenging- Folklore tells of water-horses coming ashore a night to graze on crops and in some cases leaving a slimy trail to be seen leading back into the water. There are a few notable instances that may alluded to possible scavenging behavior. Without a doubt there are more reports out there. Presumably it's more of a personal challenge for an observer to step forward and confess to seeing a full dragon lumbering about on land as opposed to an unidentifiable swimming animal. But with renewed research into Ireland's unknown aquatics beginning to accelerate and each year bring more unpublished reports to light we can only hope for a greater understanding of this elusive behavior.